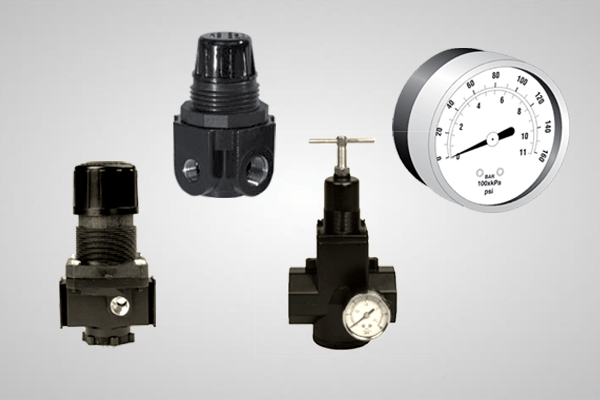 Pressure regulators are used to set the minimum compressed air pressure required for any device to function properly. In many cases companies will install blow off products like air knives, amplifiers, etc. without a regulator allowing whatever pressure is in the air line to operate the blow off product. However, you may actually not require that level of pressure. For every 20 PSIG pressure reduction you can save 10% energy. Pressure regulators allow you to set that minimum pressure that does the job, and conserve energy. Just using a shut off valve to control the pressure is not efficient as it causes a significant pressure drop. Nex Flow™ provides all pressure regulators with a gauge to indicate the actual line pressure you are using. It is wise to use pressure regulators in and blow off application. They are also useful in controlling pressure and flow rates for air operated conveyors like the Ring Vacs™’s. They can control cooling rates with vortex tubes and panel coolers as well by adjusting the air line pressure. As with filters, they need to be sized for the maximum flow rate the particular air line needs to handle for the products used.